Call sheet formats can vary dramatically depending on the type of project (documentary, narrative, still, commercial, live etc.). We talked to two 1st ADs about their process of creating call sheets and getting them approved. Ask the production company if they have a preferred call sheet template for you to use. These are generally populated with most of the top information like agency info, important contacts in Production unit, project details etc. If they don’t have a template, just use your own. Schedule the day based on the sun (if outdoors), and any other locations requirements learned from the technical scout. Hold a production meeting to discusses the schedule with your producer, production manager, DP and director (and any other production heads as required). Review the shot list, locations, time restraints, and sub-department requirements. Then update the schedule. Finalize call times and lunch for your departments based on the length of their overall day (i.e. 8hr, 10hr, and 12hr). Ensure that crew members don’t incur overtime (OT) or meal penalties (going more than 6 hours without being provided a meal). Deliver the preliminary call sheet file (.xls) to the production unit (via the LP, PM, PC, APOC) so they can review it and fill in any missing information. Once the production unit returns the proofed call sheet back to you, review it with the director and 1st AD for final approval. Send the finalized call sheet to the production unit. The PU will distribute the call sheet and manage all confirmations by phone, text, or email. Generally call sheets are sent out the day before the shoot to provide enough lead time for last minute changes prior to distribution. Often overlooked by novices, it’s important for the production unit to follow-up with every recipient of a call sheet to ensure it was received. If an important cast or crew member does not show up to set on time (or at all), the day’s shoot schedule could be compromised. Best of all, StudioBinder is free to get started. 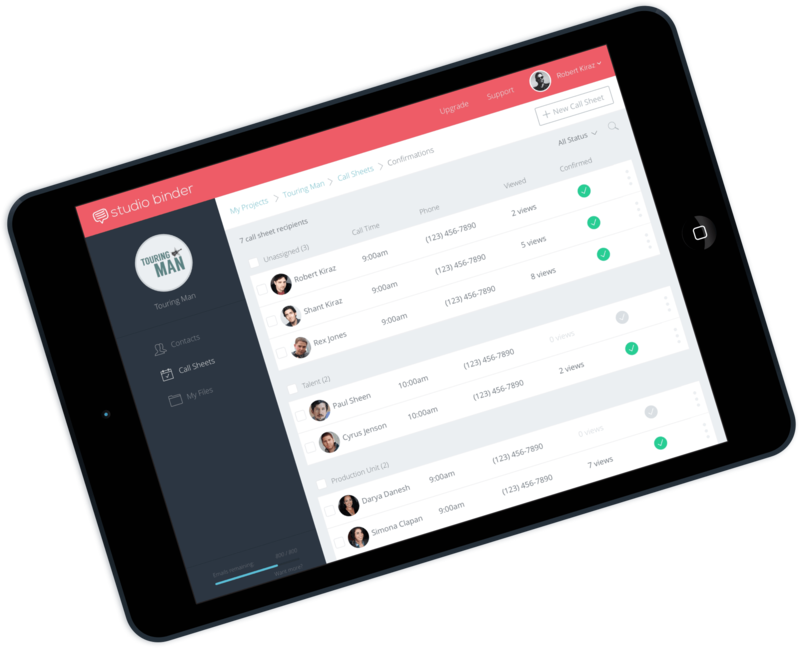 Learn more about StudioBinder’s approval system. Understanding the approval protocols when working with larger teams can help you avoid common mistakes. Now that you’re familiarized with how a call sheet is approved on short form projects, read our companion article on How a Call Sheet is Approved on Features and Television.